Following the Google path, Microsoft Bing has just integrated Twitter feeds on its news pages. Readers now have the ability to quickly access the latest buzz on what’s trending and the popular over the social network. Web surfers who browse around Bing News for a story, tweets would now be displayed in a scrolling column on the right hand-side of the page under the tab, Public Updates. 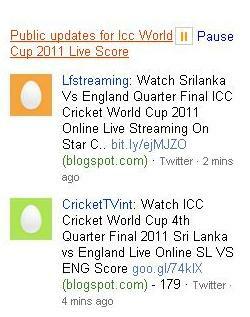 So if you search for “ICC World Cup 2011 Live Score”, you would get to see live updates from users who are tweeting in scores along with other stats as well as tweets made by websites. By adding the Twitter feed, readers would benefit from the additional source of information which are updated as real-time results. As we’ve seen with the tragedy in Japan or political turmoil in the Middle East, real people are relaying timely and compelling items not captured by traditional outlets.